At the Networked Learning Conference 2014 in April, I began an interesting conversation with a Twitter-friend, Kathrine Jensen (@kshjensen). I presented a paper at the conference on my ongoing research in the area of networked learning and digital identity, focusing on student-staff interactions in open online spaces. I cited Kris Gutiérrez’s conceptualisation of the Third Space as a useful framework for exploring the interaction of students and staff in networked publics, particularly in considering issues such as identity and power relations. Kathrine gave me some useful feedback and noted that she was using the concept of liminality in her work exploring student-staff collaboration. Hi Catherine… We had a quick chat at the Networked Learning Conference about ‘Third Space’ and I am keen to develop my knowledge in terms of this as a potential useful theoretical approach to thinking about ‘partnership’ etc. I know that you are using Kris Gutiérrez as reference for the concept of Third Space and I believe you referenced this paper: Developing a Sociocritical Literacy in the Third Space. As you may remember I was using the concept of ‘liminal space’ to explore the characteristics of the relationship between students and staff working in partnership and stepping out of their ‘normal’ role [paper forthcoming]. 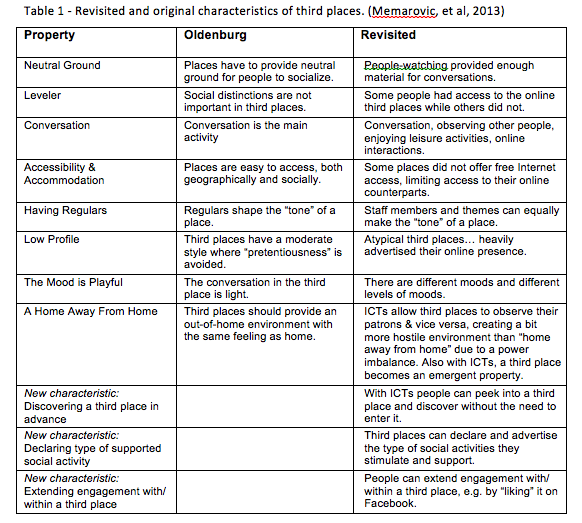 But I also just came across this article using the idea of ‘Third Place’: Where everybody knows your (screen) name: Online games as ‘Third Places‘ (Steinkuehler & Williams, 2006), in which they refer to Ray Oldenburg’s (1999) eight characteristics of ‘‘Third Places’’ – this looks quite useful. I would be interested in hearing how you think the various concepts differ or are useful in terms of what you are doing. Hi Kathrine… These 3 concepts — Liminality, Third Space, and Third Place — are all on my radar in thinking about digital identity and interactions between students and staff. Fascinating altogether! Oldenburg explicitly put a name and conceptual framework on that phenomenon that every virtual communitarian knows instinctively, the power of informal public life… It might not be the same kind of place that Oldenburg had in mind, but so many of his descriptions of third places could also describe the WELL. Perhaps cyberspace is one of the informal public places where people can rebuild the aspects of community that were lost when the malt shop became a mall. Or perhaps cyberspace is precisely the wrong place to look for the rebirth of community, offering not a tool for conviviality but a life-denying simulacrum of real passion and true commitment to one another. In either case, we need to find out soon. (p. 26). However, up to the mid-2000s, all of these articles pre-date the massive take-up of Facebook, Twitter, and social networking sites in general. For example, the first article I read which linked Oldenburg’s concept to networked publics was a 2006 article by Soukup; he was quite cautionary about the links between the Third Place concept and CMC — but his reference points were multi-user domains (MUDs) rather than SNSs. Their findings are slightly different (and more temperate) than Steinkuehler & Williams, but I think this has to do with the context, i.e. combination of physical & virtual Third Places vs. online games as Third Places. So, while it is interesting, and I will reference it, at present I’m not sure that the Third Place concept is significant in my analysis of student-staff interactions in open online spaces. This brings me to Third Spaces. The salience of this concept (as developed by Gutiérrez 2008 and Gutiérrez, et al, 1999) for my own research remains. The reason is twofold. Firstly, Gutiérrez’s conceptualisation relates specifically to learning and literacy practices in the context of schools/classrooms, rather than gaming or social spaces. Secondly, the Third Space concept addresses power relations and identity, both of which are central to interactions between students and staff in networked publics. Gutiérrez grounds her work in what she calls a “sociocritical literacy”. I’m still getting to grips with this concept, but it is powerful and holds much promise for analysing student-staff interactions across various contexts. Whereas academic literacy is often narrowly conceived along a vertical dimension (incompetence to competence), learning in the Third Space “attends to both vertical and horizontal forms of learning”, including expertise which develops “within and across an individual’s practice” (Gutiérrez, 2008, p. 149). Students bring with them to higher education a particular set of digital and network practices and literacies, developed and applicable within various contexts. As HE staff and institutions, rather than (a) assuming that students have particular digital literacies (i.e. are “digital natives”), or (b) denying the digital and network skills — and networks — which students use for informal learning (e.g. by requiring that all online pedagogical interactions take place in bounded online spaces such as LMSs), we can consider other approaches. A Third Space approach would invite students and staff to share their practices, skills, networks, etc., and then to collaborate in identifying appropriate spaces and tools for learning, and for chronicling their learning. Finally, I am seeking to engage with the concept of liminality, and look forward to reading your latest paper. As I understand it, liminality is an in-between state, between the pre-liminal and post-liminal states. I see how this applies to students, in general, who are learning to do as well as learning to be. Your work is fascinating, chronicling learning and personal growth for both the student and staff participants. I see how the concept of liminality applies in the case of this project. In terms of liminality as a concept relevant to online interactions between students and staff, I note a very interesting 2008 article by Ray Land and Siân Bayne: Social technologies in higher education: Authorship, subjectivity and temporality, in which they note the blurring of boundaries between social/informal and formal spaces, and between public and private spaces. I must wrestle with the concept a bit more, however. Is it possible to identify a post-liminal state when considering interactions between students and staff in online spaces? The process is individual, but is an unfolding — depending, of course, on the level of engagement of the individuals involved. Apologies: I’ve tried to find openly accessible article sources, where possible, but I’m not sure that every article cited above is openly available. A full list of references is below. Gutiérrez, Kris (2008) Developing a sociocritical literacy in the Third Space. Reading Research Quarterly 43(2), 148-164. Gutiérrez, Kris, D. Baquedano, P. López, & C. Tejada (1999) Rethinking diversity: Hybridity and hybrid language practices in the Third Space. Mind, Culture, and Activity 6(4). Land, Ray, & Siân Bayne (2008) Social technologies in higher education: Authorship, subjectivity and temporality. Networked Learning Conference 2008. Memarovic, Nemanja, et al. (2013) Rethinking Third Places: Contemporary Design With Technology. The Journal Of Community Informatics, Spec. Issue on Urban Planning and Community Informatics. Oldenburg, Ray (1989, 1999) The Great Good Place: Cafes, Coffee Shops, Bookstores, Bars, Hair Salons, and Other Hangouts at the Heart of a Community. Marlowe & Company. Rheingold, Howard (1993) The Virtual Community: Homesteading on the Electronic Frontier. MIT Press. Soukup, Charles (2006) Computer-mediated communication as a virtual third place: Building Oldenburg’s great good places on the world wide web. New Media and Society 8, 421. Steinkuehler, Constance A., & Dimitri Williams (2006) Where everybody knows your (screen) name: Online games as ‘Third Places’. Journal of Computer-Mediated Communication 11(4), 885-909. Many thanks to Mary Ann Reilly for creating and sharing this wonderful resource: Third Space – Curated Bibliography. The bibliography contains links to work by Homi Bhabha, Margaret Cook, Kris Gutiérrez, Edward Soja, Reijo Kupiainen, and more. There was some discussion of Third Space and Third Place in our VConnecting hangout at the ALT Conference last week (link to hangout recording). I shared this blog post and subsequently learned that several of the links were broken. These have now been fixed! Great work on this…. I’ve written something far ore informal on the topic, and this is a welcome and a much more informed and academic articulation. I also look to Putnam’s “Bowling Alone” (http://bowlingalone.com) which I find to be a fresh accessible framing of third place ideas. Many thanks, Kathrine — that’s very helpful. And enormous thanks to Mary Ann Reilly also, who earlier today shared this post: “Third Space: Curated Bibliography”. I’m indebted to both of you. *This* is what open scholarship is all about! Just carved out a bit of space today – heading off to read this now. Thanks! I intend to read the book now. Its focus is not on student-staff interactions per se, but on the concept of space in universities and academic identities (both of interest to me), particularly how academic identities are shaped by spatial interaction in university spaces. Neither review mentions whether or not Savin-Baden explores the notion of online spaces or networked publics in her analysis of university spaces — will have to see! Finally got some time to start this and I think it will be useful. “Learning spaces are often places of transition, and sometimes transformation, where the individual experiences some kind of shift or reorientation in their life world. Engagement in learning spaces does not necessarily result in the displacement of identity (in the sense of a shift causing such a sense of disjunction that it results in costs personally and pedagogically, and hence has a life cost) but rather a shift in identity or role perception so that issues and concerns are seen and heard in new and different ways. Learning spaces might also be seen as liminal in nature in that they can be seen as betwixt and between states that generally occur because of a particular need of an individual to gain or create a learning space.” (Savin-Baden 2008: 8-9). Savin-Baden, M. (2008). Learning Spaces : Creating Opportunities for Knowledge Creation in Academic Life. Buckingham, GBR: McGraw-Hill Education. Thanks for a brilliant post Katherine. There is so much to look up and explore on the concept of Third Place. I created a meetup group called Third Place (www.meetup.com/Third-Place) for the very reasons stated above. So far we have over 160 members across 5 cities in Australia and it’s informal and driven by volunteers who use the ‘third place’ to learn, network and collaborate. Ah, the usual suspects from #etmooc continue to rock the learning boat in the most wonderful of ways. Congratulations (and thanks for the link to) your wonderful paper, Catherine. It’s rich in resources and mirrors much of what I’m seeing in learning–and not necessarily just in the academic settings you’re describing; this is also happening in some of the adult-learning environments I enjoy (think #lrnchat, for example, where weekly live interactions via Twitter provide extremely stimulating explorations of a variety of topics related to training-teaching-learning). One of our challenges is to simply find some sort of uniform vocabulary to set a cohesive context for the discussion. There are, for example, the overlapping ideas of those Third Spaces and Third Places you cite; some of my own colleagues and I have been exploring the same basic idea with different terminology: a new Fourth Place (building upon Oldenburg’s word) to serve as a “social learning” environment–and the more we explore it, the more clear it becomes that we’re talking about spaces flexible enough to begin in one setting (onsite or online), move into others, and, at some point, become so completely blended that the concept of a home base (e.g., a physical classroom, a specific Twitter hashtag, a specific website) becomes irrelevant. In a real sense, that already happens when #lrnchat participants convene at conferences (e.g., those organized by ASTD/ATD), or when ASTD/ATD members convene via online meeting spaces (e.g., WebEx or Google+ Hangouts) to continue their collaborative learning endeavors. The most obvious example for us is #etmooc, which began in the formal course setting and continues now in monthly meetings facilitated by community members without being at all reliant on the original instructor/facilitators. Looking forward to seeing how much of a Third Space you manage to create through the continuing discussions here on your own blog. Hi Paul – apologies for the late reply. I headed off on holidays on August 1st, enjoyed three wonderful weeks, and I’ve been catching up ever since! Good to connect with you again, anyway, and many thanks for the feedback and for sharing your ideas re: Fourth Place. So many of our terms must be re-evaluated and redefined now that we’ve moved beyond the duality of Online and Offline — e.g. identity, space, place, and more. I’m enjoying working through these ideas with you, Kathrine, Helen, Mark and others. It helps to peel back the layers of the concepts and meanings, and the assumptions which underlie these. I can see that some of these concepts apply equally across higher education, adult learning and workplace learning — but there are also differences. I want, for example, to explore how power differences between educators and students may be experienced differently in different spaces. I’m a bit late to the discussion … I put Catherine’s email to one side to take a look at it later, then got swamped with work, one of the things of which was a friend’s dissertation on theatre as third space, so it’s definitely a very zeitgeisty thing at the moment. I’ve forwarded this to her in case she wants to contribute, but as she’s just submitted, I’m guessing she’s sick of the subject at the moment. Theatre can be used to Interpret the Emergent Space between Cultures by Janinka Greenwood Youth Theatre Journal, 19:1, 1-16, 3rd spaces are neutral spaces, but between two other spaces (1st space and 2nd space, obv) each of which is a space of another culture. I guess this has similarities with Oldenburg’s definition, in that it’s neutral, and is more flexibly defined, but it’s reached the same concept from a different path. plus you could have a workplace in one culture (which would be 2nd place of the 1st space) and a home from another culture (which one be a 1st place of the 2nd space). I can feel a Venn diagram coming on. You might also be interested in a book I cowrote with Iryna Kuksa. My bit of it is mainly about liminality, metaxis, boundaries, semiotic spaces and so on. When Iryna asked me to contribute to her book project I said yes before really thinking it through, then realised that some stuff I’d been thinking about for a while would really fit with what she was doing. It’s on the design and experience of virtual worlds (Iryna did design, I did experience). I’ve been fascinated by the similarities between a lot of concepts and spaces, Huizinga’s ideas about magic circles and ritual spaces, Suits talking about games, Gee and semiotic spaces, Wenger and boundary markers and so on, and applying that to virtual worlds. Liminality and Victor Turner and theatre also has a lot of similarities. I’ve tried to pull all these different languages together to show how they describe the same thing, but in different arenas. the book is Making Sense of Space (Iryna Kuksa and Mark Childs) published by Chandos, You might want to take a look. In case you can’t get your library to buy a copy, I’ll summarise the main idea here, which is that actually what makes these spaces conceptually different from 3rd places (and 1st and 2nd) is the central role that belief plays in defining them as spaces. I got into this from working with students in virtual worlds, whether the student actually engages their belief in the space as a real one fundamentally affects the effectiveness of their learning. Belief has the same effect in games spaces, religious spaces, theatre and so on. But while in them we operate at a level of metaxis, acknowledging on some level that the things in them aren’t really real in the same way things are in other spaces. There’s a whole bunch of other things that make them different too, communitas, liminality, boundary objects/threshold concepts (Ray Land again), role, semiotics (spot the activity theory based deconstruction). So I’ve picked the term 4th place to label them. Hope you don’t mind the plug – but I think maybe there’s a structure to defining place there that might help you describe the stuff you’re talking about. Oh just read Paul’s comment above – that he’s used the phrase 4th place too. I’d not been aware of that when i wrote the book. Hi Mark – as I’ve just responded to Paul above, sincere apologies for the late reply. I spent 3 lovely weeks on holiday beginning August 1st, and I’ve been catching up ever since! I very much appreciate your comments and the information about your book — a continuation of our interesting conversation of a few months ago [https://catherinecronin.wordpress.com/2014/02/12/openeducation-and-identities/#comments]. I’ve ordered your book, as I’d like to delve deeper into these ideas — particularly the concept of belief. This resonates with feedback I received from students some years ago re: marks assigned to a discussion forum. Several students objected to marks assigned for discussion (even for participation) and thought that the element of marking delegitimated the authenticity of the conversation. If students post comments “just to get marks” then how could an authentic discussion take place? This seems to touch on the idea of belief, as well as identity. As for the layering of spaces and places — and that Venn diagram 🙂 — I’m going to think about this further as well. Also, I’m wondering why you chose 4th Place as opposed to 4th Space? And did you deal with culture on other levels beyond national cultures, e.g. institutional cultures, or hegemonic cultures such as patriarchal culture, etc.? You’ve got me thinking… many thanks! I think there’s always going to be a limit to the authenticity of any activity that takes place in learning, because of the issue of it being marked. One of my research projects at the moment is looking at online collaboration for students in the built environment. The lecturers have done an excellent job at creating authentic learning activities; the students are going through steps that are very similar to those they would go through if they were actually collaborating on building design, and we’re analysing the interactions that take place while they’re learning, but all the way through there is an element of “doing something because it has to be marked” which wouldn’t be the case if they were doing it as part of an actual job. I don;t think there’s a way round this, we have to hope that some authenticity survives the fact that engagement has an element of being results focused. 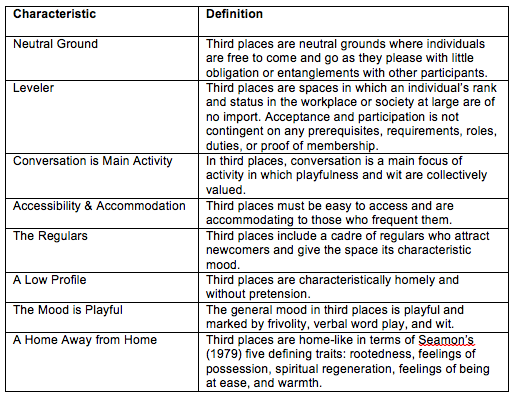 I used 4th place rather than space because I wanted to allude to Oldenburg’s terminology, and he uses place. With the stuff I looked at, I was focusing on the commonalities between use of online and offline spaces, so throughout I was only concerned with cultures that had strong associations with place, what Gee terms “semiotic social spaces”. So the very personal culture that grows up in families around a board game, the culture that develops around a congregation in church, football fans in a stadium, the various cultures in Second Life, theatre-going (which is different for proscenium-arch theatre and site-specific theatre), World of Warcraft, would all be examples of this, rather than at the bigger scale of national, and institutional. I only touched superficially on each of those though (it was just a monograph that was part of a co-authored book after all) but hopefully the argument holds – at least enough to trigger more discussions. The question about institutional cultures was pretty much ducked by me as it does require more thought. Indeed, my “4th place” idea was challenged by one reviewer who said that all places are experienced only because of shared belief, for example, we all come together to work in second places under the shared delusion that the work we do matters. Needless to say *that reviewer also worked in education. 🙂 That was a bit too fundamental for me to also get into; hegemonic cultures are less visible as belief structures because they *are so pervasive. However, for the same reason they are so pervasive, I am not convinced these hegemonic cultures alter our reading of some places in the same way as the place-specific ones do. After all, the semiotics of hegemonic cultures are everywhere. Anyway, thanks for buying the book. Any feedback would be appreciated. Thanks for your reply, Mark. I take your point about the tension between authenticity and marking — it is an inevitable struggle within formal education, although many of us try to ameliorate that as much as possible 🙂 I will certainly get back in touch once I’ve had a chance to review your book — I’m looking forward to it! I’ll be speaking at the ALT conference next week, and will briefly describe my work exploring educator and student identities in open spaces. I will allude to some of these ideas on Third/Fourth Space/Place, albeit only briefly. I hope to engage with others who might be doing similar work. In any case, thank you for sharing your thoughts. I’ll be in touch soon. I love this wiki-blog-Twitter collaboration, Alyson 🙂 Thank you for commenting here and for adding/editing the Third Place page in #FeWikiHappening — not a mess but great food for thought! I am learning so much about Federated Wiki through this experience, despite not having a great deal of time — it’s very exciting. I’ve just gone in and edited the Third Place a bit more. We are creating together. It’s a wonderful thing. Oooooh. Good work. Must ponder.